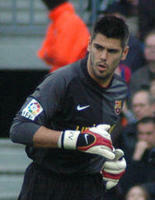 Víctor Valdés Arribas (born January 14, 1982 in L'Hospitalet de Llobregat, Barcelona, Catalonia, Spain), nicknamed Víctor, is a Catalan football goalkeeper, who currently plays for FC Barcelona of the Spanish La Liga. Before joining the principal team in 2002/03 season, Víctor played for the youth teams and Barca B. Currently, he has a contract with Barcelona until 2010. A Catalan in his club!! He started his career with Barca's youth teams when he joined from Peña Cinco Copas on the 1st of July 1992. But in September of the same year he moved away with this family to Tenerife and had to leave the club, rejoining only three years later. After returning he made quick progress through the youth system and was made part of the senior squad in the 2002/03 season. The early part of the season saw him play second fiddle to the then Argentine international Roberto Bonano. The arrival of Radomir Antic as the new coach saw regular first team opportunities for him. In the 2003-04 season, he emerged as first-choice goalkeeper, and in the 2004-05 season, he played in almost all of Barcelona's matches helping Barcelona to their first league title in six years. He also won the Zamora Trophy for the best goalkeeper in Spain. In the 2005-06 season he helped Barça to the double. He played a big part in Barca's UEFA Champions League 2005-06 title and in the final against Arsenal he denied Thierry Henry twice from point-blank range. His efforts saw him singled out for praise from Coach Frank Rijkaard. The "Zamora" title however eluded him as Víctor came third after Santiago Cañizares and the winner José Manuel Pinto. One of his most important saves this season came on February 11, 2007, when he saved Racing Santander's Ezequiel Garay's penalty shot and kept a clean sheet for the game. Barça won 2-0 with both goals coming from Ronaldinho. It has quickly been pointed out the Iker Casillas failed to save two penalty kicks from the same player in the match in which Real Madrid lost 2-1 this season. Many of the current FC Barcelona squad, especially Samuel Eto'o, constantly convey anger at the little credit Valdes receives for the victories that the team gains despite his constant match-winning saves. Eto'o's views were clear for all to see when on May 5, 2007, he scored the second goal for Barça against Real Sociedad and decided to run the length of the pitch to celebrate with Victor in thanks for his efforts. In a press conference Eto'o admitted: “Before going out on the pitch, I already had it all thought out in my head, because he always puts his arms up by himself while the rest of us are celebrating together”. Although he makes good saves he has been known to make errors, especially the one mistake he made in the UEFA Champions League 2006-07 against Liverpool. Despite this, it is evident that Barça would not be in the La Liga title race this season without him as the squad was depleted due to the severe injuries to Samuel Eto'o and Lionel Messi. Barça players have expressed dismay that he should be blamed for the end of Barça's season due to one mistake. On June 17, 2007, the last round in La Liga, Victor matched a goalkeeping record of the Barcelona legend, Andoni Zubizarreta. It has never been matched, by any Barça goalkeeper, until Valdés. The record held by Zubi is that he went all season long, all 38 rounds in La Liga without leaving the starting line-up nor getting substituted. Victor Valdés did the same this season.